Besiktas vs Bayern München ended with another convincing victory by the Bavarians as the German record champion brush aside the Turkish champions with an 8-1 aggregate victory. Jupp Heynckes sets a new Champions League record. Sandro Wagner wins player of the match. Vagner Love with the concelation goal. Despite Bayern having won the first leg 5-0 head coach Jupp Heynckes opted to select his strongest possible squad. In what was an electric atmosphere at Besiktas Park Thomas Müller had the first chance of the game in the ninth minute when Tolga Zengin spilt a David Alaba freekick, the German national team player, however, skied the rebound. In the 18th minute, Bayern did take the lead breaking forward the ball ended up with Müller on the right flank and the forward curled a cross into the box where it found a wide open Thiago, who had no problem tapping the ball home from a close range. Bayern continued their clinical approach to this game. Holding on to possession the probed Besiktas’ defence patiently looking for an opening that would allow them to double the lead. Perhaps the only blow for Bayern at this point was that Thiago had to go off with an injury in the 34th minute – he was replaced by James Rodríguesz. Going into the second half, Bayern had the majority of the play leading the match not just on the scoresheet, but also in shots on goal (five to eight) and shots inside the box (two to six). The first half was a clinic by the Bavarians on how to deal with a match efficiently that was already won before kickoff. Bayern doubled the lead within moments of kickoff. Rafinha found space on the right wing and his cross was poorly cleared by Gökhan Gönül, who put the ball into his own goal. Ten minutes later James almost doubled the lead. Frank Ribéry brought a cross into the box where Arturo Vidal headed the ball to an outstretched James, who failed to get the ball past Besiktas keeper Zengin. Bayern’s dominance was only broken after a mistake by the backline. Bayern keeper Sven Ulreich passed the ball outside to the left corner where Rafinha and Niklas Süle made a meal of it allowing Vagner Love to win the ball and the Brazilian runs into the box beating Ulreich one-on-one despite being under pressure by Vidal. At that point, it almost felt that Bayern could let the positive result in Istanbul slip with Besiktas pressing to get the tying goal. The Germans, however, showed at this stage why they are such a consistent side in Europe. Calming the game down they were able to keep Besiktas at bay and at the same time looked dangerous on the counter-attack. 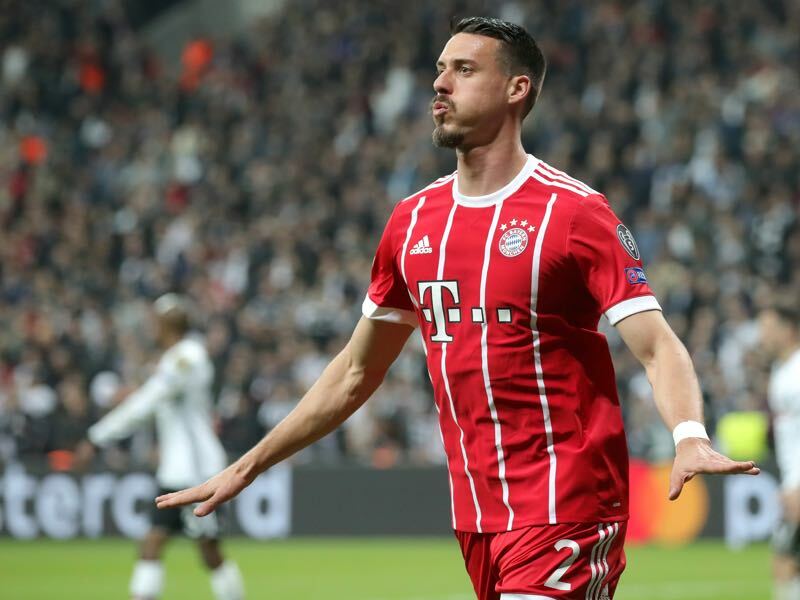 In the 84th minute, one of those counter-attacks led to Bayern’s third goal with Sandro Wagner chesting home a cross from Alaba from just three-yards out. The goal killed it off, and the Bavarians romp to an 8-1 aggregate win. Sandro Wagner came on at a time when Besiktas were pressing for the equaliser. The striker gave Bayern some much needed physical presence and was there to seal the deal for the Bavarians chesting home a cross by Alaba to make it 3-1. Jupp Heynckes is now the coach with the most Champions League wins in a row passing the record set by Carlo Ancelotti and Louis van Gaal. With an 8-1 aggregate victory over Besiktas Heynckes could further extend this record in the next stage of the tournament, as Bayern are now among the favourites to win the trophy in Kyiv. Vágner Love has scored his first Champions League goal for Besiktas, 2361 days after scoring his last for CSKA in the competition – in 2011, against Internazionale. Thiago scored his 100th goal for Bayern München. With his eleventh win, a row Heynckes sets a new Champions League record.